This article was originally published on the Delicious Brains blog, and is republished here with permission. You know that a fast site == happier users, improved ranking from Google, and increased conversions. Maybe you even think your WordPress site is as fast as it can be: you’ve looked at site performance, from the best practices of setting up a server, to troubleshooting slow code, and offloading your images to a CDN, but is that everything? With dynamic, database-driven websites like WordPress, you might still have one problem on your hands: database queries slowing down your site. If you don’t want to install a debugging plugin on a production site (maybe you’re worried about adding some performance overhead) you can opt to turn on the MySQL Slow Query Log, which logs all queries that take a certain amount of time to execute. This is relatively simple to configure and set up where to log the queries to. As this is a server-level tweak, the performance hit will be less that a debugging plugin on the site, but should be turned off when not using it. Once you have found an expensive query that you want to improve, the next step is to try to understand what is making the query slow. Recently during development to our site, we found a query that was taking around 8 seconds to execute! We use WooCommerce and a customized version of the WooCommerce Software Subscriptions plugin to run our plugins store. The purpose of this query is to get all subscriptions for a customer where we know their customer number. WooCommerce has a somewhat complex data model, in that even though an order is stored as a custom post type, the id of the customer (for stores where each customer gets a WordPress user created for them) is not stored as the post_author, but instead as a piece of post meta data. There are also a couple of joins to custom tables created by the software subscriptions plugin. Let’s dive in to understand the query more. That’s cool, but you may already know about it. But did you know that the DESCRIBE statement prefix can actually be used on SELECT, INSERT, UPDATE, REPLACE and DELETE statements? This is more commonly known by its synonym EXPLAIN and will give us detailed information about how the statement will be executed. At first glance, this isn’t very easy to interpret. Luckily the folks over at SitePoint have put together a comprehensive guide to understanding the statement. The most important column is type, which describes how the tables are joined. If you see ALL then that means MySQL is reading the whole table from disk, increasing I/O rates and putting load on the CPU. This is know as a “full table scan” (more on that later). The rows column is also a good indication of what MySQL is having to do, as this shows how many rows it has looked in to find a result. Explain also gives us more information we can use to optimize. For example, the pm2 table (wp_postmeta), it is telling us we are Using filesort, because we are asking the results to be sorted using an ORDER BY clause on the statement. If we were also grouping the query we would be adding overhead to the execution. 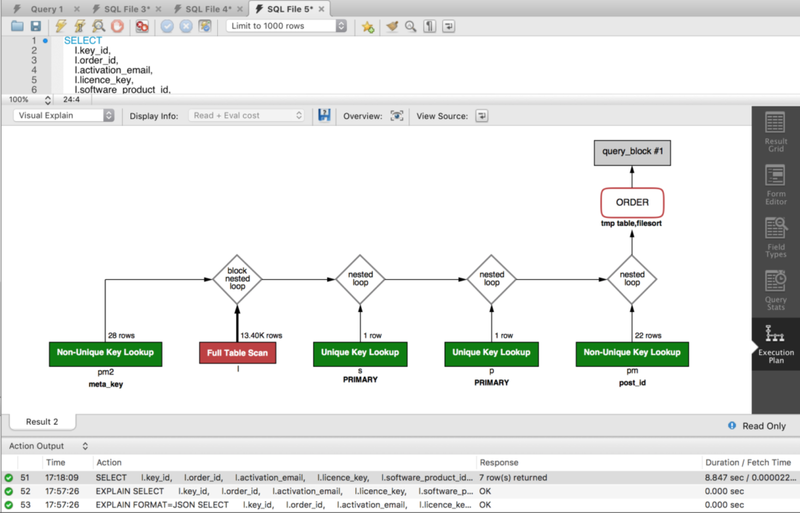 It automatically draws your attention to issues by coloring parts of the query by cost. We can see straight away that join to the wp_woocommerce_software_licences (alias l) table has a serious issue.